The Tao of Gini: Hola. Aquí están algunos toques de luz de Navidad. Hola. Aquí están algunos toques de luz de Navidad. So anyone with a toddler will understand the title of this post. "Hello. 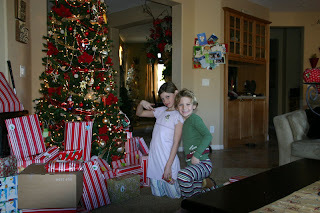 Here are some Christmas highlights." 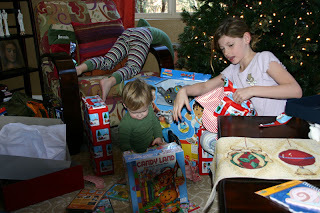 It is in Spanish because this was a "Diego" kinda Christmas here this year, for Garrin. Cute pictures below. Seeing as my last post was dated December 25th at 1:03am, I will pick up from there. Went to bed to only be awakened by Hannah and Connor at 6am. "Please, please - go back to bed - and let's wait until Garrin wakes up!! (which hopefully will be around 10am, we were thinking). 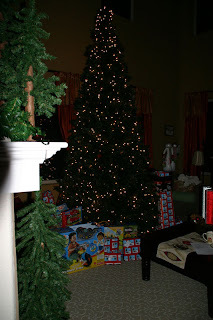 8am came and we strolled down the stairs to the delight of the kids. 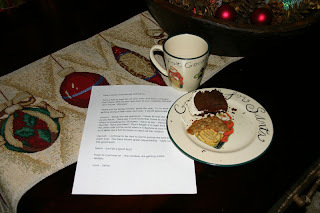 Here is the letter Santa left. Notice how computer savvy he is - typing the letter to the kids using our computer and printer. Hmmm. Notice too, that he was unable to eat the entire, delectable, but a little dry whoopie pie that the kids left out for him. Also take note that Santa drank all the milk because he needed to wash down the somewhat stale, but still delicious, round cake of heaven. This is the tree that Santa left all the gifts under. How nice and neat and organized Santa is. All packages are facing the right way. Hmmm. 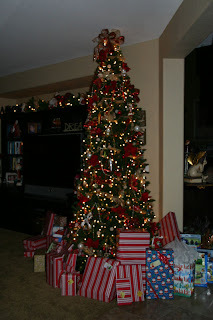 Here is the tree that contains all the presents from our friends and additionally all the gifts we wrapped for the kids, hence our late bedtime of 1am. 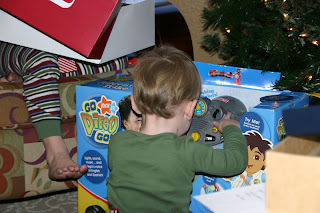 Here is Garrin, getting his hands on the first of many Diego themed gifts that Santa and Bill and I graced him with for the holiday. Can he get any closer to it???? 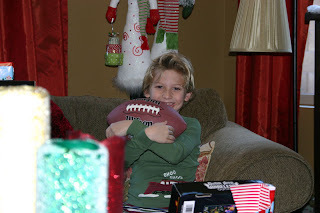 Anything sports related, which usually coincides with a ball of some sort, is what makes Connor the happiest. Can you tell??? Later in the afternoon, Chris and Allison and James came over for dinner. 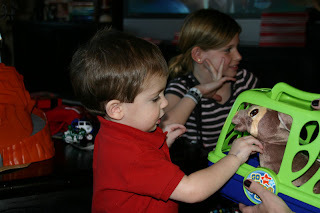 Here is James opening one of the many Diego things we got for him too. My brother just loooooovvvves Diego, and is excited that the kids are learning another language so early in life. Could my nephew be any cuter? 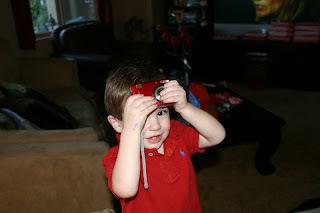 Here is James trying to take pictures with my camera. He is such a little smarty pants. 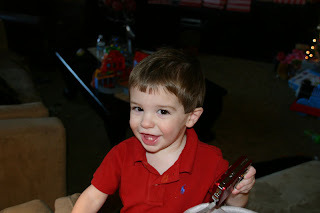 Here's a cute little video of Garrin pushing the buttons on his new Diego tricycle thingy. Hope everyone had the holiday they wished for. Now its time to clean up all this crap and put it all away!!!! uuummmm and C.R.A.Z.Y.! Santa isn't so particular at our house for some reason hhuuuummmmmm??? p.s. I see Santa wasted 1/2 or better of a whoopie pie. I will Whoopie pie his you know what for that!